This is a multi-week project that can either be done as a project assignment outside the classroom or adapted to be carried out over a shorter time scale. Project can be adapted to a variety of age ranges. Many different units are used to quantify energy. One way to manage energy resources is through conservation. B) Recognizing citizens' rightrs and responsiblities. A) Identifying and investigating issues. B) Sorting out the consequences of issues. C) Identifying and evaluation alternative solutions and courses of action. C) Planning and taking action. D) Evaluating the results of actions. B) Evaluating the need for citizen action. Requires educator buy-in and active promotion throughout the run of the project. Parts of the Eco-Quiz will have to be changed to reflect the educator’s geographical location since some questions deal with conditions (water supply, etc.) in northern New York. Can be used in a distance learning setting. Although this is a multi-week project, it can be used over a shorter time scale and adapted to a variety of topics and age ranges. Project can run in the background of a course, so it does not require 3 weeks of actual class time. Connects personal actions to the larger-scale problems of energy use. 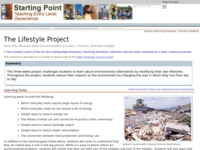 Allows for quantified approach to students' energy use and waste output. Solid background materials for educator. An original approach to getting students involved personally in energy use and climate change. Project is very relevant to students’ lives. Many ways to approach the project and the exact categories are up to each student. Use of an eJournal is a good tool to monitor student progress. Strong plan for assessment (evaluating eJournals, having embedded questions in the eJournal, and provides ancillary assignments). Very good advice on how to kick off the project and also how to maintain student motivation through the project. Includes introductory quiz, calculators, and exercises for measuring energy use. Well organized and laid out for ease of use by both students and educator. MS-ESS3-4:	Construct an argument supported by evidence for how increases in human population and per-capita consumption of natural resources impact Earth's systems. MS-ESS3.C2:Typically as human populations and per-capita consumption of natural resources increase, so do the negative impacts on Earth unless the activities and technologies involved are engineered otherwise. MS-ESS3.D1:Human activities, such as the release of greenhouse gases from burning fossil fuels, are major factors in the current rise in Earth’s mean surface temperature (global warming). Reducing the level of climate change and reducing human vulnerability to whatever climate changes do occur depend on the understanding of climate science, engineering capabilities, and other kinds of knowledge, such as understanding of human behavior and on applying that knowledge wisely in decisions and activities. MS-C2.3:Phenomena may have more than one cause, and some cause and effect relationships in systems can only be described using probability. MS-C3.4:Scientific relationships can be represented through the use of algebraic expressions and equations. MS-P1.8:Define a design problem that can be solved through the development of an object, tool, process or system and includes multiple criteria and constraints, including scientific knowledge that may limit possible solutions. MS-P4.8:Analyze data to define an optimal operational range for a proposed object, tool, process or system that best meets criteria for success. MS-P5.4:Apply mathematical concepts and/or processes (e.g., ratio, rate, percent, basic operations, simple algebra) to scientific and engineering questions and problems. MS-P6.8:Optimize performance of a design by prioritizing criteria, making tradeoffs, testing, revising, and re- testing. MS-P7.3:Construct, use, and/or present an oral and written argument supported by empirical evidence and scientific reasoning to support or refute an explanation or a model for a phenomenon or a solution to a problem. MS-P8.5:Communicate scientific and/or technical information (e.g. about a proposed object, tool, process, system) in writing and/or through oral presentations. HS-ESS3-6:	Use a computational representation to illustrate the relationships among Earth systems and how those relationships are being modified due to human activity. HS-ESS3.C1:The sustainability of human societies and the biodiversity that supports them requires responsible management of natural resources. HS-C2.4:Changes in systems may have various causes that may not have equal effects. HS-P3.6:Manipulate variables and collect data about a complex model of a proposed process or system to identify failure points or improve performance relative to criteria for success or other variables. HS-P4.2:Apply concepts of statistics and probability (including determining function fits to data, slope, intercept, and correlation coefficient for linear fits) to scientific and engineering questions and problems, using digital tools when feasible. HS-P4.6: Analyze data to identify design features or characteristics of the components of a proposed process or system to optimize it relative to criteria for success. HS-P5.2:Use mathematical, computational, and/or algorithmic representations of phenomena or design solutions to describe and/or support claims and/or explanations. HS-P5.3:Apply techniques of algebra and functions to represent and solve scientific and engineering problems. HS-P6.3:Apply scientific ideas, principles, and/or evidence to provide an explanation of phenomena and solve design problems, taking into account possible unanticipated effects.